Lizzy and I have been on a decorating kick lately and quite frankly we're amazing at it. 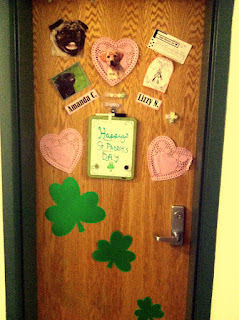 We got pink heart doileys and a garland of hearts that are hung around our beds and window. Luckily, her mother picked us out some similar decorations for St. Paddy's Day! (Which, mind you, is spelled with a "ddy") This is our fabulous door, with a picture to represent each of it's inhabitants: Lizzy, Alec and I. It also has our names spelled out on Candy Hearts taped to it. Needless to say, it fits us perfectly. And yes, my side of the door is covered in pugs. Here is a view of the inside of the door. 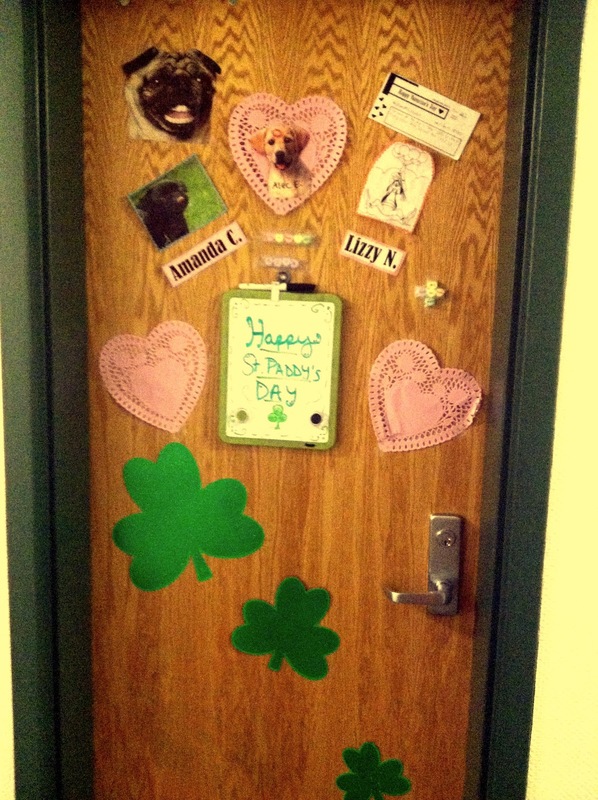 We attempted to hang three-leaf clovers above the door and the St. Paddy's garland around this general area. Unfortunately, we woke to these decorations on the floor. It was a sign that they needed to be moved. We re-positioned the garland on the outside of the door and it really completes the door. Both of our closets are stocked full with clothes, which we decided to leave in the photo. This way, all of my raging blog fans get a true sense of what our humble little dorm room looks like. 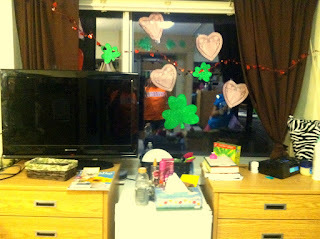 Here is the leftover Valentine's Day decorations surrounding the window. We added some clovers to the scene to create a lively view for all of the passerby's outside. No college students were injured in the hanging of these decorations. 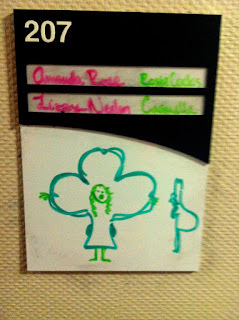 Finally, here is a beautiful portrait I drew of Lizzy dressed as a clover. It is in honor of St. Paddy's Day and exemplifies the spirit that we captivate through our decorating. I hope everybody is having just as great of a time decorating as we are. This is the most inspiring blog post I have read ever. Your room mate Lizzy seems really awesome. Like probably one of the coolest people I've ever heard about. You're really lucky! Also you are great. Truly spectacular. Your sarcasm is simply endearing, secret admirer.